Noshwalks has been conducting foodie walking tours of the Bronx for over 10 years. My tours concentrate on the diverse cultures that make up the Bronx such as Italian, Ghanaian, and even good old American barbecue. Here are some of the tours you can enjoy with Noshwalks in the Bronx. Also, don't forget about our other tours in Manhattan, Brooklyn, Queens, Staten Island, and parts of New Jersey. Visit our Walking Tour Schedule to see which tours interest you the most! Sign up for one of our public food walking tours of the Bronx, or call to schedule a custom tour for your group outing. This tour of century-old Little Italy of the Bronx visits this neighborhood’s famous indoor market, restaurants, cheese shops & bakeries. 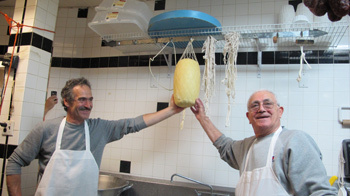 On this walking tour you will experience mozzarella being made by hand and view the coal-burning oven of Belmont’s oldest bread bakery, founded at the end of the 19th century. This tour now also includes a brief stop at a new barbecue restaurant and, weather permitting, we buy homemade tamales from a local Mexican vendor. On this Noshwalk, we visit three different areas to experience the diversity of the Bronx, including at least two artistic/historic venues. We begin near Yankee Stadium (with Italian and Dominican treats) and walk along the Grand Concourse to the newly renovated (and free!) Bronx Museum of the Arts. In this neighborhood is a thick cluster of West African restaurants and markets, where we'll have some tastes. Then we take a bus to have lunch in a popular Ghanaian eatery. Afterward, we'll visit one of the best Mexican markets in the Bronx (and sample Mexican ices, some of which are flavored with hot chili). We'll take a mini-hike (walk off some of our lunch and create space for dessert!) and head to the Hall of Fame of Great Americans. Afterward, we'll have an espresso coffee and flan in a Dominican restaurant. Quite a filling day! Introduced in 2014, this Noshwalk spotlights a food diversity and history in a slice of the Bronx that foodies have yet to devour, including quite a few markets.. so bring a backpack! Tastes are drawn from a selection of Guyanese, Guinean, Mexican, Dominican, Trinidadian, Salvadoran, Bangladeshi, and more places - it depends, in large part, on YOU! We'll also pass a popular steakhouse specializing in Caribbean goodies - we'll probably get some delicious appetizers. This area is in the throes of revival, with many small businesses. and is also home to a historic library, church and graveyard, plus a set of bank murals depicting the early days of the Bronx. (These are different from murals seen on other Bronx Noshwalks.) Weather permitting, we take our goodies to an attractive playground to dine 'alfresco". 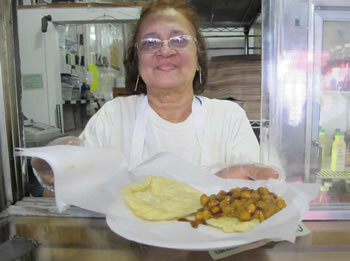 This tour explores two quite different neighborhoods in the central Bronx with delicious food and tantalizing sights. Our tour includes one of New York City’s last great movie palaces, a landmarked bank building that includes five murals depicting the early Bronx painted during the Works Progress Administration in the 1930s, and Poe Cottage—Edgar Allan Poe’s last residence—and a look at the newest library in the Bronx, a stunning “green” building which is also a crossroads in this very diverse borough. Food visits include a Dominican bakery (think:delicious café con leche and flan!) and possibly the only Cambodian market in NYC as well as two unusual African and West Indian markets. We’ll then take a short bus ride to a neighborhood where we’ll have Pakistani appetizers and Albanian bureks! For dessert, we will head to the nearby Morris Park neighborhood for Italian gelato and espresso! Introduced in 2012, this new tour explores both the architectural history and the new food developments in and around Parkchester, a city-within-the-city that opened in 1941. Parkchester is now a microcosm of New York City's diversity, and our tour not only examines the community design (which includes several hundred terra cotta mini-sculptures scattered around the area) but also samples various local cuisines: Mexican, Bangladeshi and assorted other tastes available at a huge local Chinese market whose shelves also offer products from Southeast Asia, West Africa, the Caribbean and Central America. Part II of our tour (via a short bus connection) goes to the Van Nest neighborhood, where we visit a cluster of relatively new Palestinian and North African markets, buy food from a Yemeni restaurant, and conclude with dessert at a 90-year-old Italian pastry shop. Bring binoculars on this tour to see the sculptures close up! This new tour focuses on a stretch of the Bronx literally known as The Hub and areas around it. In addition to tasting food of the Caribbean, Mexico, Central and South America, and West Africa, plus visiting a 50+ year old Italian restaurant, this tour incorporate architectural and cultural highlights, including a historic mural and one of the traditional "casitas" ("little houses") built in community gardens to replicate similar outposts in Puerto Rico. As this tour develops, it will eventually incorporate a visit to a local brewery that will be building new headquarters in the Bronx. This tour spotlights two enclaves in the north Bronx within easy walking distance - but worlds apart! Wakefield is home to a growing Caribbean and African community and offers wonderful tastes of Guyana, West Africa, Trinidad and Jamaica. We'll have lunch hear and taste some spicy Indo-Caribbean foods (plus home made ginger beer, guaranteed to clear your sinuses!). From here we walk to the Woodlawn neighborhood, including a visit to famous Woodlawn cemetery, resting place to many eminent musicians, politicians, business leaders, journalists and more. Following a visit here, we'll head to Woodlawn for savory pie, Irish trifle and a quaff!